Jewelry design, Crafts and Fun! Every have one of those creative blocks? You know what you want to create but it just doesn’t seem to be working with your vision? Well that didn’t happen to me when I raided my bead stash this month. I found inspiration when I opened my box of pendants and saw two of the new Blue Moon Beads Amulets staring up at me and before you know it I had two really pretty necklaces created. But wait inspiration didn’t stop there I came up with a pretty bracelet and a cute little summer ring. The Amulet Collection from Blue Moon Beads is so inspiring and pretty, head over to your local Michael’s store and check out all the pieces. You’ll be ispired to make your own beautiful jewelry. The Buddha symbol brings “Enlightenment”. 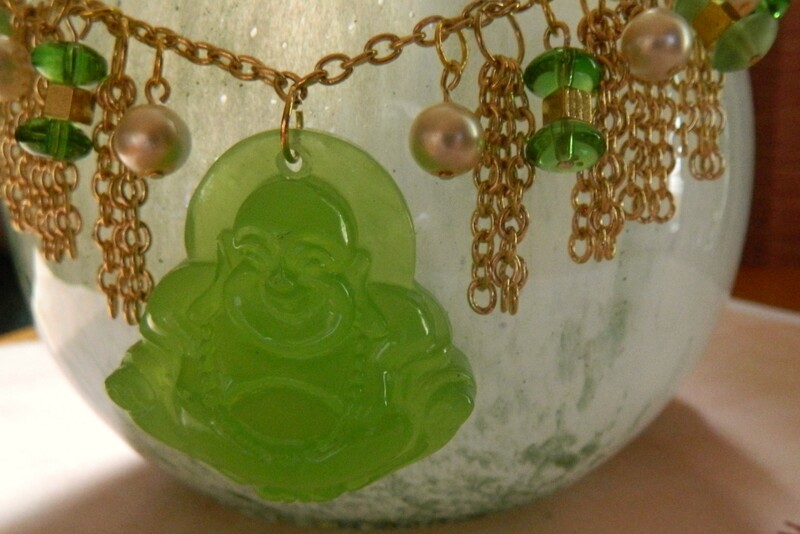 In the case of this necklace he certainly enlightened me to create this pretty necklace. Using Blue Moon Beads 27″ Gold Chain, Blue Moon Beads 5″ String of BD Glass Green Beads, Blue Moon Bead Glass Pearls I added all this to the chain using head pins and jump rings, added the Buddha and finished it off with a goldtone toggle clasp. The Owl is Symbolic of Wisdom and Foresight. I certainly felt wise while making this necklace. 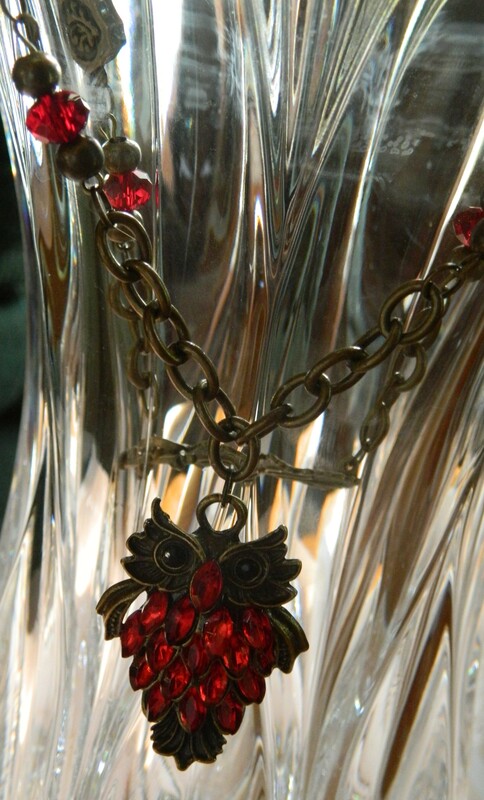 I love the Blue Moon Beads Owl Amulet, so using some antique brass chain, links and red swarovski crystals I was able to pull this piece together in about 30 minutes. While your at the craft store look for the Blue Moon Beads Bangle Bracelet. Then look through your stash of beads like I did and I bet you will find some big hole beads you forgot you had. Twist off the end of the bangle, add your beads and you have an instant bracelet. Bonus of this is you can change up this piece to match any outfit or fit any mood by just changing the beads around. 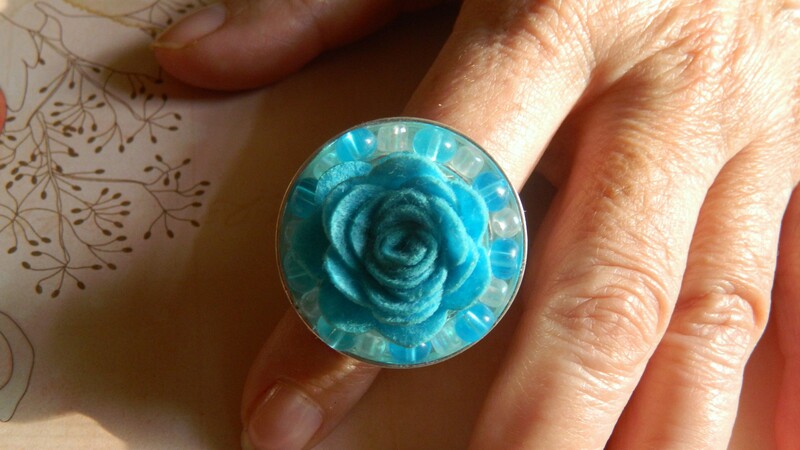 My last inspiration was this sweet little summer flower ring. Simple, fast to make and your going to get tons of compliments, everyone will want to know where you got it, and you can tell them you made it yourself. A ring blank, a Katidid bezel, some clear 6’0 sead beads and some larger blue beads, glue this to the ring blank, then use a Blue Moon Bead Fashion A La Carte fashion flower (these come in 4 colors in the packet) and glue it in the center of the Katidid bezel. Your now all set with jewelry to wear with your summer outfits.